Finally, we have shipped Documentation Insight V2 Professional. Visit the What is New page to see the new highlights and improvements introduced in V2. For those who pre-ordered the upgrade license and purchased V1 since Sep. 1st, 2011, we have sent you the new serial number and activation code. Please check out your inbox. It is necessary to download the latest installer and then use the new license to activate the product. 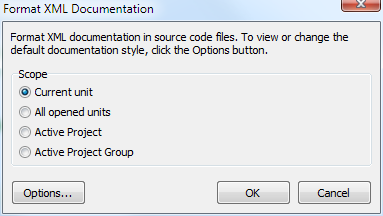 The Documentation Explorer will construct the code structure of the projects in a second. 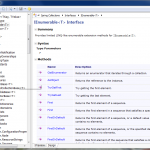 It makes it easier to understand the code library and document your code. 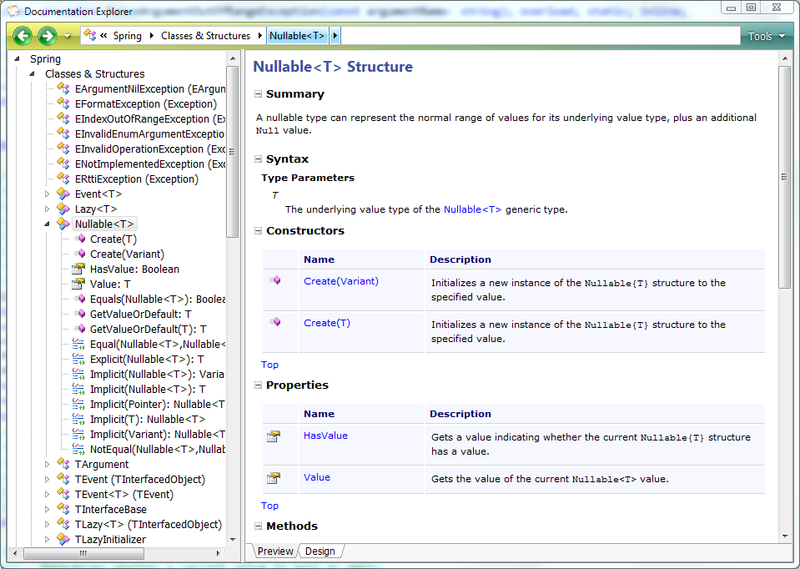 We plan to add syntax definition, object graph, edit member summary, auto sync, and more features in future releases. This tool helps you format all well-formatted xml documentation to the new style for better readability (Good for V1.x users). It also solves some other issues (e.g. line breaks for <see> tag causes compiler xmldoc generation failed) . 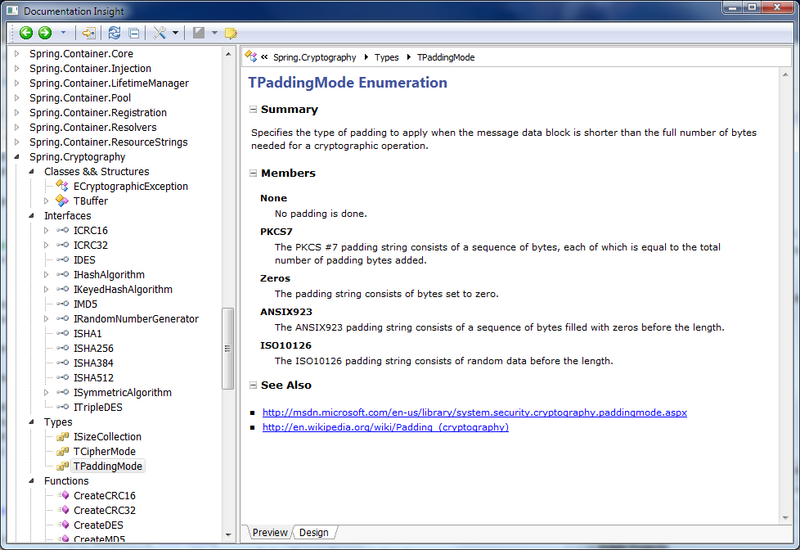 This feature will check all xml documentation and show invalid pieces in the Messages window. 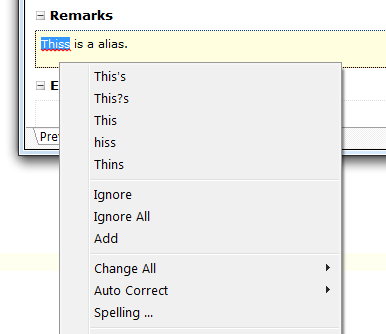 It makes it easier to correct all xmldoc comments errors. 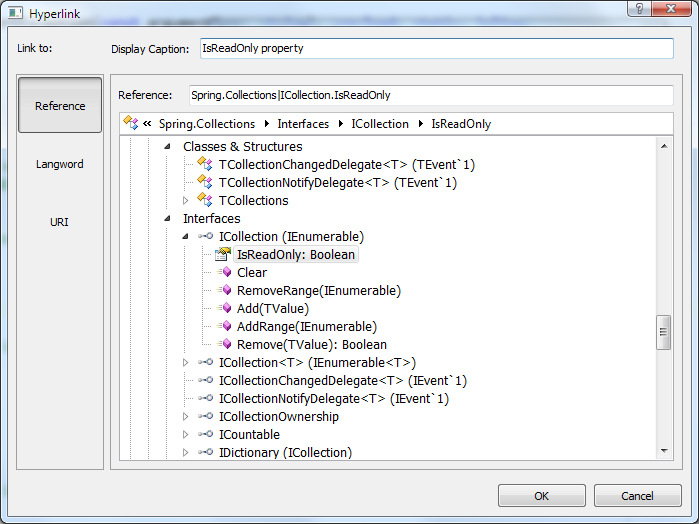 A live code structure tree will be shown in the Hyperlink window. You can use V1.x serial number and activation code to register this Beta version, otherwise, it will be run as Trial Version. However, it will be expired on April 1st, 2012. You need to uninstall it then. Note: All prepaid customers will get email notifications when the new registration is ready. Thanks for you continued support!! * The installer doesn’t uninstall V1.x version if you have installed them. By the coming of the Chrismas Day and the New Year, we are offering a special discount for all developers. a). If you haven’t purchased Documentation Insight, preorder Documentation Insight Professional V2.x before Jan 1st, 2012 will save you 30%. Please click the Buy Now link in the Purchase page and use the following coupon code in the final payment page in ShareIt. 1. You will get licenses and activation code of 1.x when the payment has been verified. We will send new licenses to you when V2 is announced. 2. We provide 30 day no questions asked money back guarantee. You can get full refund for the first 30 days if our products can’t meet your need. We use Share It! as our online order provider and we do not have access to your financial information. b). If you already have licenses of Documentation Insight V1.x, use the following link to prepaid to upgrade to Documentation Insight 2.0 will SAVE 50%. Upgrade to Documentation Insight V2.0 Professional NOW. For all users those who have purchased Documentation Insight V1.x in last 3 months (From Sep. 1st, 2011 to Dec. 21th, 2011), You will be FREE upgrade to Documentation Insight V2.x. You might have noticed that there are so many highlights in Documentation Insight V2.0 which was mentioned in last post. Recently, we have been asked by so many Delphi Developers about the timeline of Documentation Insight V2. Here are two snapshots to show the power of the new version. 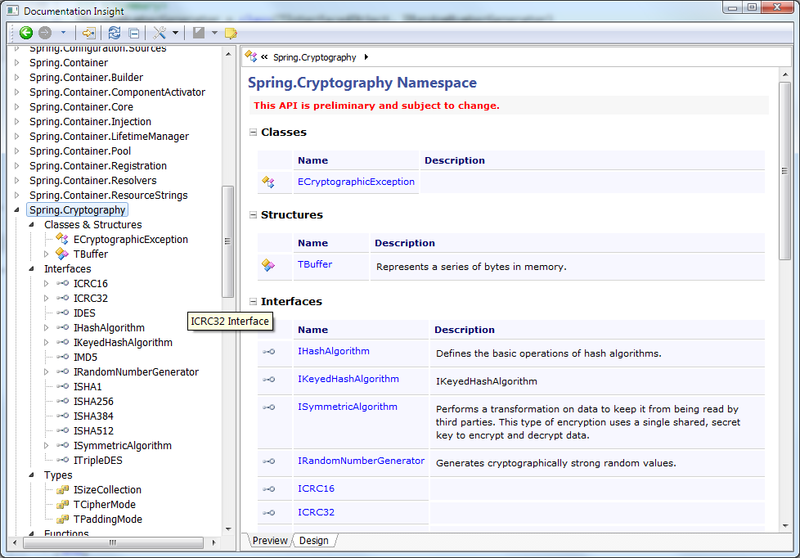 Take #1 You may browse all members in a Namepsace, including classes, structures, interfaces and global functions, etc. All links are live and can be navigated. The following snapshot shows the member list of a certain type (class/structure/interface), still, you can click a certain member to view its details. Actually, we were extremely busy on a daily company project in recent weeks which postponed the progress of DI V2.x. We will continue the development of V2.0 in a few weeks. Due to the huge work of DI V2, the new price will be adjusted to 99 EURO. We also decided that if you purchase the V1.x before Dec 1th, 2011, You will be able to upgrade to V2.x for FREE. Thanks for you continued support, all of you! 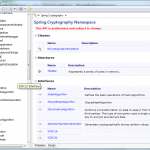 We have just released a minor update of Documentation Insight. 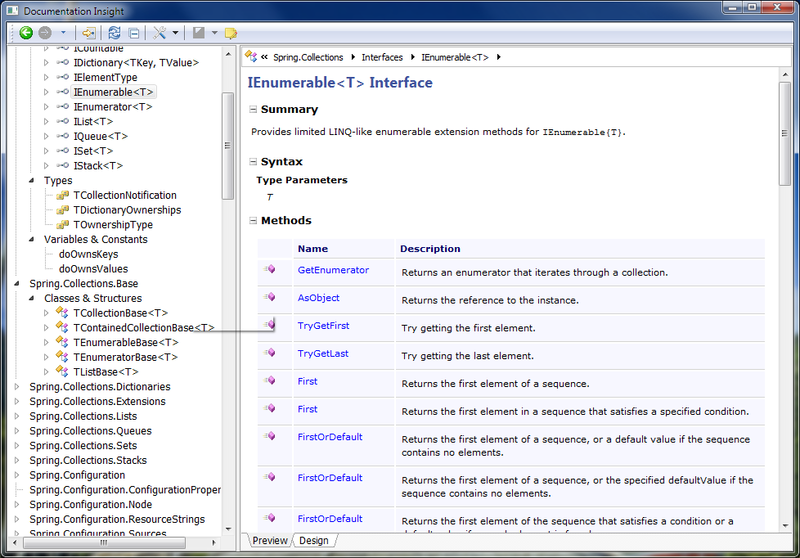 This update fixed a Crash error when closing the Delphi IDE if Documentation Insight window was docked. Just like a live “MSDN” library, Documentation Insight will instantly construct the structure from selected project files in a second so that it will be much easier to understand a library/application as well as document all code elements in a place. We also plan to allow you to document summary of members of structured types (class, record, interface, etc) in future releases (just like the present way to document enumerated types). We will announce when the first Beta is available. Generally, you will get response in one business day. Thanks for you continued support!